Our growing team of TrikeBuggy pilots are out carving up the sky! On any given weekend, there are dozens of TrikeBuggies being flown by their (bugs-in-teeth) happy aviators, enjoying the magic of wheels attached to their powered paragliders. These are some of the active owners of our units (in no particular order) out doing their favorite activity - The Buggy Boogie! Minari successfully mated to the TrikeBuggy - It's DONE! Finally soloed my Trike buggy yesterday, Wow took a long time coming but perseverance payed off! Thanks for your help. The catch in hand is made of TrikeBuggy, it took time because the weather this summer was very windy and turbulent. Attached some pictures of Frenchy and his equipment, I fly to the land of "Cognac" surrounded by vineyards and sunflowers. My TrikeBuggy is admired daily by school instructors fighter pilots of the French Air Force, based in Cognac city. It is of the envious. Chad, here is a photo for you. I call her the "Flight Taster" Leonardo's quote. 35 flights and counting. Hey Chad, It's been a while, I've been very busy trying to get everything taken care of with training and what not but now I can finally say I am a student pilot!!! My trike buggy/miniplane works awesome and I am now trained to fly it. Please see the link for my second take off at Frank Savignac's field in Sussex New Brunswick Canada on July 30th. I now have 10 successful take offs and landings under my belt and am looking forward to many more. I want to thank you again for helping me realize this life long dream by being so helpful with getting me my trike, I couldn't have done it without my Trike Buggy, I absolutely love it. Thank you very much!!! Perhaps some day we may meet in person at a fly in or something, maybe maybe not, regardless please continue to do what you do and again thanks so much for all your help and understanding during a very stressful time in my life, I will STRONGLY recomend you and your gear to anyone I talk to regarding Powered Paragliding in the future. I just recently returned from a few days of flying my TrikeBuggy with Chad Bastian as my instructor. What a great time I had at El Mirage. 1/. For comfort I have added a lumber support behind the back pad. It’s an aluminium frame with the back of an office chair attached. I can spend hours in the air now and not feel uncomfortable at all. 2/. Another set of collar clamps with “D” shackle behind the riser loops to rig an overhead reserve. The reserve bridle is held in place with some tiny zip lock strips. 3/. Slung a camel back between the back pad and motor for drinking water. My TrikeBuggy was the hit at the fly in, everyone said what a good looking set up I had, it was very nice! I love my trike so much, I must have 30 hours on it already, more then I used my footlunch for whole summer. Thanks again. Flew the bullet yesterday for the first time. What a wonderful machine!! The Black Devil had loads of power, and the nice low center of gravity of the bullet made the slightly rough grass runway totally tolerable. The wide wheels of the deluxe buggy turned forever as I climbed away from the field. Flexifoil obviously spares no expense, even down to quality wheel bearings. Once airborne, I was suprised how stable I was under the wing. I think this speaks volumes for the low attachment points. Just wanted to drop you a line with some long overdue pictures. These were taken last Sunday by another pilot on the ground while I was doing touch and goes. It is a joy to fly this unit. Thanks a million.If you need a beta model test pilot in South Florida, I am your man. I got my trike buggy put together and have been practicing with it. Guess what, my knees don't hurt now after practicing. Got the wife to take a pic to send to you. While Jerry and Brandon do not fly the TrikeBuggy, they have been avid supporters and true friends. Jerry flies a highly modified Fresh Breeze Flyke which he has tinkered with endlessly in his quest for the ultimate flying machine. He is now working on a Delta Trike, getting ready to go faster! Thanks for the TrikeBuggy I think it’s the best out there. I’ve got 8 flights and love the TrikeBuggy! Hope to “fly into you” some time. I have been flying all summer with the Trikebugy and loving every minute of it . Don't know if you ever flew in Massachusetts, but here is my you tube of a flight over Lake Chargoggagoggmanchauggagoggchaubunagungamaugg for short we call it Webster lake. Some facts to go with the Pilot profile: I started flying in the spring of 08 and have had 14 flights in my Freshbreeze 122 Airboss powered Trikebuggy. 48 years old and have been wanting to do this from age 14. Livin' The Dream!! Bob already has a TrikeBuggy Basic with a Fly Products Kompress attached, but when we lost the Tandem Exemption earlier this year, he needed something to do with his Fresh Breeze Monster Hirth 313 cc paramotor. He came over and got a Deluxe with Stainless Steel Power Loops and the new Low-Hangpoint Kit. Nice Ride! More pictures HERE. I have to say that I have put the TrikeBuggy through the mill and it is a great product. I want the Falcon Tandem hang glider and also want to use my MZ 34 engine. Lets start with the Delta Kit that you explained needs shorter uprights and different clamps, etc. It's time to upgrade. Again, I want to pass on thanks for the quality of the Trikebuggy. I am absolutely loving it! I have been flying it since the end of August, and, I haven't keep perfect logs, but, I am around 20 flights, and around 30 hours. I am so excited to get this stuff... I am hopefully going to swoop up and down my street a few times just to test it all out before I go to training. James got the first delivery of the TrikeBuggy Bullet Deluxe, version 2.0, which adapts to more motors like his new Revolution Paramotors Flat Top. This is one awesome buggy! Zach came all the way down from Northern California to take lessons and pick up his TrikeBuggy Bullet. These are the first pictures he sent of his flights at Pillsbury Lake, near where he lives. The Buggy is a super flying machine. It was perfect! Here are some short video clips from my first flights. Bob Moss first flight, 5-10-2008, 0645, Dyer, NV. All went well, smooth air, a few ripples at shear zone at 100 feet above ground. More fun than a pilot should be allowed to have. Hey Chad, Couple of pictures. The one in the seat is my daughter Kristine. Love the buggy. I have about 15 flights on it, and about 40 Touch and goes' and not a single problem. David came to the Paratoys 2008 Fly-In, and was immediately taken with the new Bullet design. He waited patiently during a period where it was difficult for us to obtain parts, and in the end, I sent him the one I was flying at the event! Click on the picture, and you'll see him with his TrikeBuggy Buddies Dan Decker and Dwight Willis on what looks like a glorious day of flying! Dwight upgraded the Power Bars to the stainless steel version, plus he also added the EZ OnOff, and it really looks nice with his Fly Gold! With the A-Assists, this buggy is about as easy and comfortable as flying ever gets! You are free to post any pictures I send you. Paul will probably have more up on his web site this week. I am the one in the white "T" and John is in the blue. I did buy the A assist from Paul, it makes it so much easier for us old farts. This machine is an awesome piece of equipment. I love it. RC ordered two TrikeBuggies for him and a friend, but it looks like it will be a while before they will be flying them with all that white stuff on the ground! I hear they will be going to Florida soon to get some airtime, and their first flights on the TrikeBuggy! "Hi Chad, I have flown the TrikeBuggy Delta with a Falcon 1 225 and FP Gold 130. I find the combination very easy to fly. Last month I made a 30 mile XC flight. So far, I have about 20 takeoff and landings and 5-6 hrs flight time." "I do have some photos of me with the TB Delta that I will send to you. I have many scenic photos of Puerto Rico that I have taken flying with the PPG, and lately the TB Delta, that I can share with you if you are interested." "Chad, it is like 23 degrees here. I hate this stuff. Every evening I tell my wife I am going to California, so I grab a couple of beers and get on the computer and put your videos from El Mirage etc. on and dream of warm weather. Please keep the vids coming. It really helps us unfortunate folks get through the winter." As you can see, Mike has balanced his TrikeBuggy Deluxe perfectly on his simulator, and is visualizing a perfect launch! Video of some practice inflations. Ben came all the way from Kansas to Santa Barbara to learn free flight paragliding and powered paragliding, and ended up watching the TrikeBuggies fly all day at the Salton Sea while the wind was calm. It didn't take much time before he decided he wanted to do it too! Ben and I had a magnificent sunset flight over the grasslands of the Carrizo Plains in our TrikeBuggies a few days later. Chad, I just had my first flight in Kansas!!! It was so awesome. I just don't know how to thank you and describe how amazing it was. WIth the wider frame and A-assists allowed me to balance the wing quickly and enjoy the flight. It's been over four hours since landing, and I'm still on a rush. So glad I went with the buggy trike. Once again, thanks Chad. It was euphoric!!! 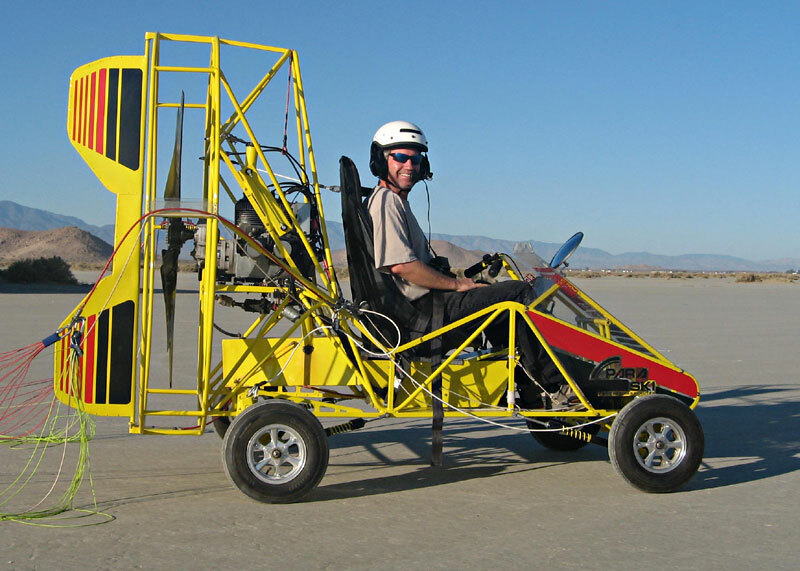 Joe picked up a TrikeBuggy Basic and Simonini at the Paramotor City Albuquerque Fly-In in 2007. His first flight was captured on video, and the big smile on his face in the picture at left was just after landing. Trevor is a gregarious guy that has way too much fun doing just about anything and everything! He is an enthusiastic TrikeBuggy Deluxe owner with just about the biggest smile on his face after he flies that you can imagine. Pierre is an extremely gifted pilot, both with and without power. He flies the TrikeBuggy Basic most of the time at Jean Lake, near Las Vegas, Nevada. He made a really cool trailer hitch transporter for his Buggy. Bob has been teaching and flying free fligh paragliding for many years now, and decided after watching us fly these silly trikes that he wanted in on some of that fun! He now flies a TrikeBuggy Basic for solo fun, and a Flash Deluxe when he takes his sweetie on tandem flights. His new Green Roadster is pretty sharp looking! Sean picked up a TrikeBuggy Deluxe at the Salton Sea Fly-In in 2007. Later that year, I saw him again and he had not flown it since, so we hooked it up again and he had a great time flying it with his reflex wing! Jackinape is his YouTube name, and he flies a Blackhawk 313cc motor and a Paratoys wing in Ashland, Montana. Some great launches here, very concentrated on keeping the wing in balance before liftoff. Nice countryside too! Greg learned to PPG Trike on the Flash Trike, but soon saw the befefits of the TrikeBuggy Basic, expecially how nicely it all fit into his Honda Insight! Greg is an avid free-flight paraglider as well as a very accomplished TrikeBuggy pilot. The last time Greg came to El Mirage, he took the TrikeBuggy Delta out for some taxiing, and ended up getting some short flight hops (oops!) in the hang glider trike. I think he liked it! Chuck Ross is an Ultralight and PPG instructor that we met at Bob's Salton Sea Fly-In last February. In November, we saw him again and he had a chance to fly the TrikeBuggy Delta, and now he's budgeting to get one for himself! Watch the Video of his first flight on this magnificent little microlight! Mounting the Revolution Paramotors Flat Top Simonini was actually quite easy using the newer Hip and Motor clamps we designed. Mike is also sporting the new, square design Power Loops - lowering the risers and brake positions for the Deluxe Buggy. Lee has a big barn on his property right near Michelle and Jerry Danielle's Paramotor City in Albuquerque. Lee can be seen on many mornings cruising "low & slow" along the terrain near the Rio Puerco on his TrikeBuggy Deluxe. 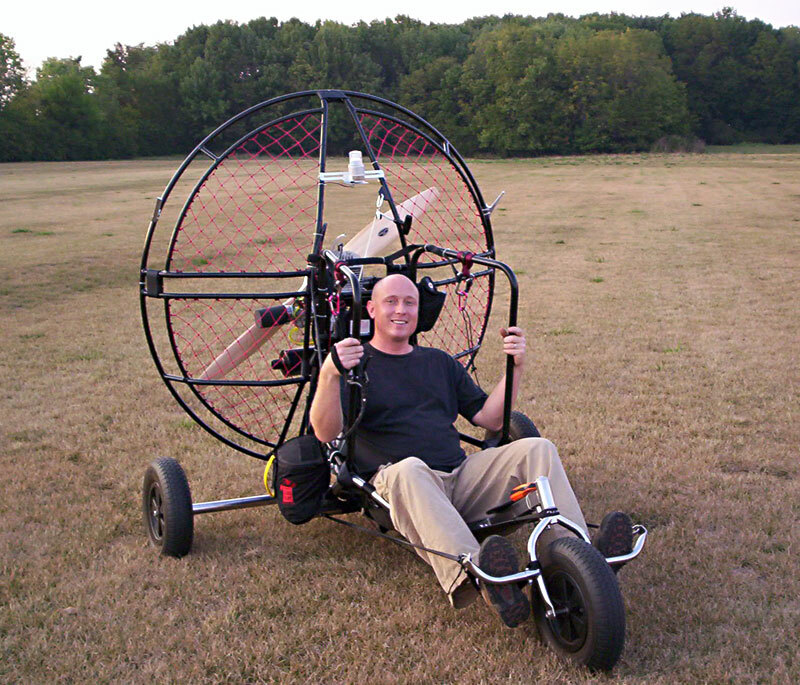 John runs Dayton Powered Paragliding, and now offers the TrikeBuggy to his clients. He got one of the first embroidered back pads, and sent me a picture of it - even before I received the first shipment of them! Hadley is one of Fly Above All Paragliding's gifted free flight students that is exploring all the ways of enjoying aviating using paragliders. He has a TrikeBuggy Basic and an Ozone Rush. I went up just a bit late today. Over a sod farm, I flew into a dust devil with the TrikeBuggy. I couldn’t see it because of the turf (no dust). According to my vario, I briefly went up at over 3,500’/min, did some 90’s or more, got tossed around, and then got dumped into 850’/min sink on the backside. I have never been in air that violent – ever. I am extremely thankful I was flying the Trike as I had about 110 lbs. of extra loading on my Rush. It collapsed briefly but re-inflated instantly. I had about 400’ of altitude which made it safer. The cool turf weakened the DD, thankfully. I thought you would like to know: The TrikeBuggy saved the day! This all happened at about 11:40AM, over an hour later than I normally fly. Another good reminder to stay out of the air in the desert mid day. Richard just recently send me a picture of his TrikeBuggy mounted to an airframe built from V2 plans using a Simonini with a Fly Products engine redrive. Looks like a nice ride! Ziggy and two of his friends ordered TrikeBuggies, and we sent them off to Canada! We're hoping they will send some more pictures soon, but I know it's winter there, and there may not be too much flying this time of year. This video shows a nice launch, but the landing was a bit of a plop. "I've had better landings" he says. We're sure he'll have many more. Gotta love those A-Assists! Mark was one of the first TrikeBuggy owners. He got the Buggy, and quickly wrote back his experiences with it, and his musings are still up on our Testimonials page! Mark now flies a Powered Parachute because he likes the awesome POWER they have. We have flown together many times, although I have to use a VERY small wing to keep up with him! He still waxes poetic about his experience with the little TrikeBuggy. Chad is the developer and test pilot for both the paraglider and hang glider versions of the TrikeBuggy, shown here preparing Rocky, the Flying Whippet for a short flight around the dry lake. "I think it will fly" is what this optimistic guy is thinking. Unfortunately, the left bar you see broke clean off during the first flight - good thing there was a redundant strap going to the hip of the buggy!